and helped build the great pyramids of Egypt. 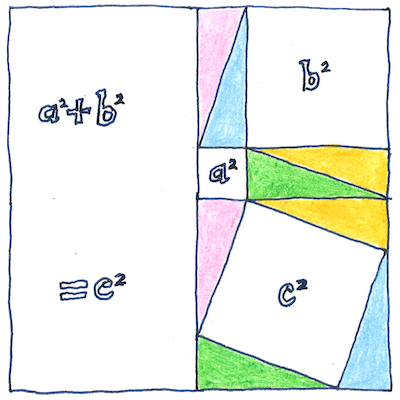 the sum of the squares of the other two sides. rearranging in a square four copies of the triangle. derived from the chord function. between the two points on the circle. The chord of 60° is the radius. is the square of the diameter. The X and Y axes in the Cartesian coordinate system form right angles, and the line between the origin and any point not on either X or Y axis is the hypotenuse of a right triangle. The sine and cosine in modern trigonometry are ratios of the hypotenuse with the opposite and adjacent sides of a right triangle whose hypotenuse starts at the origin of the X and Y axes and ends at the circumference of the unit circle whose center is the origin. The Greek root of the word trigonometry is trigōnon, an ancient triangular lyre or harp. The vibration of musical strings create standing waves and their form can be expressed using trigonometric functions. Fibonacci’s method for generating Pythagorean triples seems to me to be complete. If you are interested, I can give you a Java program that implements his method.